Oh, Rosy, you don’t even know the heavenly hornet’s nest you just stirred up. If you checked out my post yesterday, you learned all about Rosy Garcia – a very inspiring girl and special friend of mine whom I met through my involvement with Step Up Women’s Network, an organization that I just love to bits. That one innocent text led me to deciding that instead of just taking her to afternoon tea, as I had planned, to celebrate her hard work and UC Berkeley acceptance, I needed to give this girl a day of pampering before she took off to begin her new collegiate chapter. But I knew I couldn’t do it alone. So I gathered some of my top-tier beauty friends and salons, who were excited to help, and we ended up giving her a day to remember. As much as I had meant for it to be a gift for her, it ended up being an even bigger gift for me. I got to spend a day with Rosy and get to know her not only as a mentee and Step Up alumna, but also as a friend. Learning more about Rosy led me to respect her even more than I already did, and made me very giddy about the future she has ahead of her. Now, every time she texts me or posts on social media, it’s like connecting to a member of my family. The pride I feel for her accomplishments? There’s nothing like it. Pure joy. Here’s what Rosy experienced on Reward Rosy day, thanks to my talented and generous friends in the beauty world. Let it inspire you to take a “Reward You Day” of your own at these, a few of my fabulous beauty meccas. 8 am Gagik of Uber started the day off on the right foot by picking Rosy up at her home in an Uber Black car. 8:30 am Then he dropped her off to meet me for a quick breakfast at Blu Jam Cafe, where we had the sweetest waitress, Chloe, who made sure the breakfast was a delight! Rosy needed to fuel up for the big day ahead! And I, unfortunately, had to hot-step it over to Santa Monica to record some voiceovers for Marshall’s! 9:30 am I dropped off Rosy for 3 hours of pampering at Zenii Skin and Nails, where the ladies of Zenii made her feel like a queen. I’ve been going to Zenii myself for a while for all sorts of services. So what keeps me going back? It just feels like home. It’s comfy, quick and everyone’s courteous and, thankfully, creative. On the agenda for our girl, Rosy? They started with their Classic Laddi Facial ($60) by esteemed esthetician, Candace, whose facials and waxing are SERIOUSLY legendary. She was left with clean, gorgeous and glowing skin – just what a UC Berkeley student needs to get her on the right path of a lifelong skincare regimen. Next, they shaped her brows, giving a defined frame to her already beautiful face. And lastly, she enjoyed a gel manicure ($40) and a Classic Ladii pedicure ($25). And, lastly, those lovely ladies of Zenii gifted her with a beauty kit of her own to maintain her look, complete with exfoliating gloves and nail care kit. Zenii is zeee best! Queen Rosy getting her Ladii pedicure at the fabulous Zenii Skin and Nails. What's she thinking, you ask? "I could get used to this." 12:30 pm Next on Rosy’s agenda? The hair she was dreaming about at Maven Beverly Hills, with my friend – and fellow southern belle – Meredith Morris. After consulting with Meredith and showing her Rosy’s ombré inspiration pics, she decided to do some of her famous melted highlights and ombré to create Rosy’s dream look. Now, here’s what you have to know about Maven Beverly Hills. It reminds me of the salons I grew up going to in Dallas…except, well, a bit more chic. Besides Meredith’s visionary talent, when it comes to the coifs she creates, her design aesthetic is straight off of my favorite Pinterest inspiration boards. So, not only are you getting a great color and cut, but you’re doing it in the most pretty, pristine environment in town. And Meredith’s beautiful blue eyes and charming accent certainly don’t hurt. Aaaaaaand Post-Meredith (PM). Oh shoot, I already did that! Okay, we’ll go with Post-Meredith. After this pic, Meredith moved on to her next appointment (she's a busy gal) but she was kind enough to let our next surprise take place at her studio! 2 pm: In comes my friend – and suuuuper talented makeup artist, and all-around sweet gal – Colleen from Pixi Beauty to give Rosy a makeover. And not just a makeover. Pixi also gifted Rosy with all of the beauty essentials she’d need as a busy UC Berkeley babe! 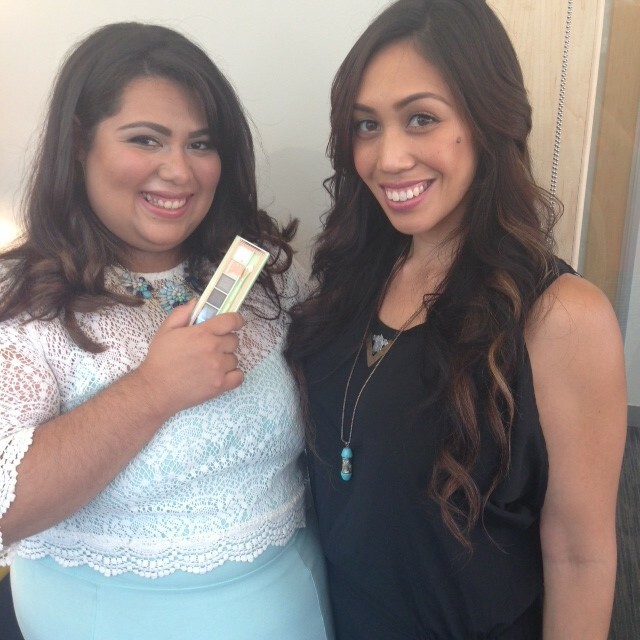 Here’s Rosy with her favorite Pixi shadow palette! Rosy with her new friend and beauty guru, Colleen from Pixi. Just LOOK at those brows!! 3 pm: I had planned one last surprise for Rosy – afternoon high tea at The Peninsula Beverly Hills. And, it was a treat for me too because I’d never had afternoon tea there before in its entirety! It was luxe, y’all. But the more luxe part was getting to just sit…and relax after a busy day…and really catch up and connect with Rosy. For more of what we talked about, read yesterday’s post. Be sure to read what Rosy has to say about why she’s one of the most confident people I know. I promise it’ll inspire you, like it did me. As for the yummy stuff? Ohhhh. It. Was. Good. No big deal. Just Rosy and I sipping some tea and showing off our gorgeous Zenii gel manis. Um, did I mention that it was yummy? 6:30 pm: We went to The London West Hollywood rooftop pool! Not just randomly. I had an American Brand Project event to attend, and I had the prettiest date in town! We took in the sights of the city and snapped a few pics before taking Rosy home. I thought I looked like Cher from Clueless in this pic. Rosy LOVED it. I think because it's funny? Or ironic? Or both. But now, I love it, too. Because it's the perfect pic for the end of our perfect day. Really. A PERFECT day. When can you say that? And I have to tell y’all this. Sorry to out you, my friend, Rosy. But my favorite part of this whole day? Rosy just couldn’t stop looking at herself in the mirror. She’s a humble girl, so don’t get me wrong. But it speaks volumes about what an impact Zenii, Maven and Pixi Beauty had in making her feel her best as she headed off to UC Berkeley that week. At one point, I was asking her a question repeatedly, and she was so distracted by her own beauty, she didn’t even hear me. My heart just melted. It really was my favorite moment because I knew we’d made something special happen, which is exactly what I wanted for this girl, Rosy, who makes special things happen for everyone all the time. The note I wrote for Rosy on the Cover Girl Inspiration wall at a VMAs event the next night.